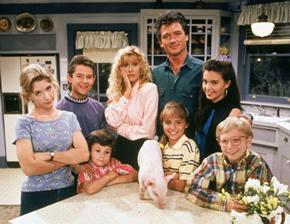 Widowed beautician Carol Foster (Suzanne Summers) lives in Port Washington, Wisconsin, with her three children: a very smart perfectionist, Dana (Staci Keanan); conceited model hopeful, Karen (Angela Watson); and computer-loving Mark (Christopher Castile). Across town, divorced construction worker Frank Lambert (Patrick Duffy) raises his three children: the unmotivated J.T. (Brandon Call); tomboy Alicia or “Al” (Christine Larkin); and cheerful youngster, Brendan (Josh Byrne). While on separate vacations in Jamaica, Frank and Carol meet, fall in love, and marry on a whim. The series begins as Carol and Frank return to Port Washington and surprise their children with the news of their marriage. Neither the Lamberts nor the Fosters take the news very well about and the sitcom follows their struggles to blend the two families into one. The Foster-Lambert’s extended family includes Carol’s man-hungry younger sister Penny (Patrika Darbo); Carol’s outspoken mother, Ivy Baker (Peggy Rea); and Frank’s spacey but loveable nephew Cody (Sasha Mitchell), who resides in a van in the family’s driveway. The family grows even larger when Carol and Frank have a daughter together, Lilly (Emily Mae Young). In later years, J.T.’s friend, Rich Halke (Jason Marsden), dates Dana and moves into the house. Flamboyant French hairdresser Jean-Luc (Bronson Pinchot) also becomes a partner in Carol’s salon business. Why did they take step by step off the Disney channel in 2014?